Rescue puppies from alien traps and keep them safe in your Puppy Sanctuary! Brush them, play ball with them, watch them play on rocket lifts, skateboards, trampolines and more. You can even grab them and plonk them in the bath to keep them clean! All the gems you'll need to buy toys and decorations for your puppies are obtained by playing the game (not In-App Purchases). You can also search for food and firewood supplies within the ancient island ruins. - Retina display ready on both the iPad & iPhone. - Lots of cute puppies, with their own stories. - Search for supplies within the ancient ruins. - Gather gems to purchase toys and decorations. - Play with your puppies to keep them happy. - Relaxed, Timed and Tricky game modes. - Separate iPhone & iPad levels. - Game Center support & achievements. Try Puppy Sanctuary for free today! 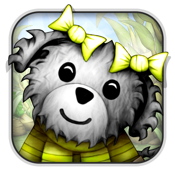 If you enjoy it, please use the single 'Full Version' In-App Purchase to rescue all 40 puppies! Kitten Sanctuary is also available on the App Store. Rescue 50 adorable kittens from those pesky aliens! Try out the Lite edition for free today! "Right away I jammed the button for the full version, and now I'm getting treats, food bowls, and other stuff. I haven't even scratched the surface of this deep game yet!" "Definitely, surprisingly, since I never played the kitty game, one of the best, most addictive games I've played in recent memory!" "Just finished off what's available for free, every second was thoroughly enjoyable, and well ... that silly Bernard, knew he'd like the bubbles!" "As with Kitten Sanctuary this was an instant purchase. Even though it's too cute and fluffy for my taste, I still have to rescue all those kittens and puppies!" "I downloaded the game last night and immediately bought the full game. This game has me hooked, lined and sinkered and all in a good way!"